Walker’s new Razor-X and Razor-XV operate like electronic muffs — allowing you to hear commands and conversations while still blocking loud noises. The Razor-X combines a collar unit (containing the electronics) with retractable, foam-tipped ear buds. Unlike conventional earmuffs, the Razor-X system doesn’t interfere with your cheek weld. The patent-pending earbuds provide an impressive 31dB of noise reduction, with the ability to hear commands. To ensure a good fit (for best noise reduction), the Razor-X and Razor-VX come with two styles of noise-reducing foam tips. An AC wall adapter with USB port and a one-meter micro USB cord is provided. READ Razor-X User Reviews. Right now, Cabela’s is running a big sale on all types of ammunition from major manufacturers. Save as much as 20% off regular pricing. For example, Winchester 9mm pistol ammo is marked down from $13.99 to $11.99 for 50 rounds. And PMC X-Tac 5.56×45 ammo is reduced from $9.99 to $8.49 for 20 rounds. Plus, you can get FREE SHIPPING on all orders of $99.00 or more. Use Code 86BUY during checkout (code valid through 8/31/2016). Looking for a Panda or Atlas Action, or a complete match rifle? Here’s a great promotion from our friends at Kelbly’s. 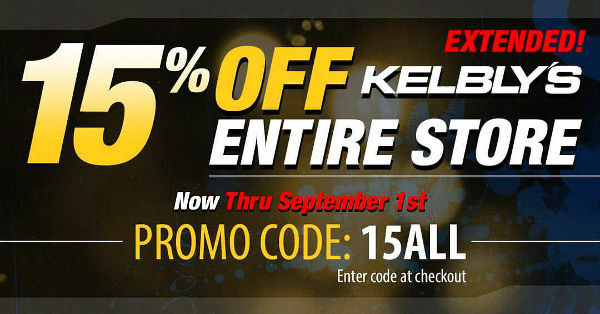 Now through Tuesday, August 23, 2016 you can get 15% of ANYthing on the Kelblys.com website. That includes rifles, actions, stocks, barrels, scope rings, muzzle brakes, Berger bullets, accessories and more. To save big, use code 15ALL at checkout. Don’t delay — this offer expires at 11:59 pm on September 1, 2016. 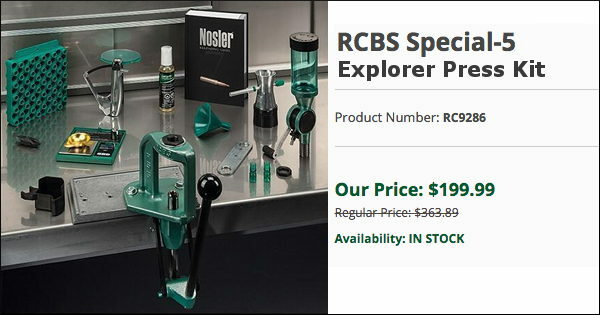 This brass tumbling system contains everything you need to clean your cartridge brass: Vibratory Case Tumbler, Rotary Media Separator, 6 lbs. of Corn Cob Media, and 8 oz. of Brass Polish. Right now this whole system is on sale at Midsouth for just $73.70. The case tumbler, which holds 450 .223 Rem cases or 1000 9mm cases, has a three-year motor warranty. This is a good deal for the package. 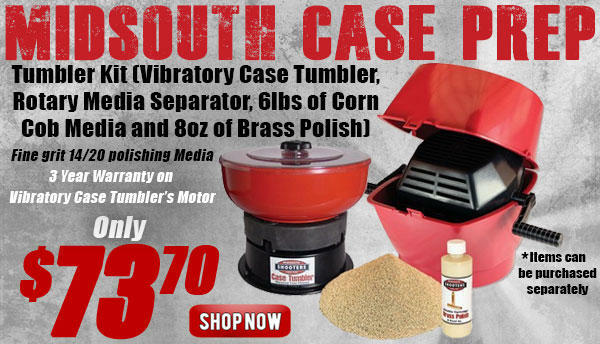 You could pay $65.00 for a good vibratory Tumbler by itself. Right now you can get a nice, wood-stocked Browning A-Bolt III Hunting rifle in .308 Winchester for just $689.99. And, to sweeten that deal, the current “Browning Benjamins” Rebate program knocks $50.00 off, so the price (with rebate) is just $639.99. This package includes a Nikon Buckmaster II 4-12x40mm BDC scope. This same Browning/Nikon special is available in many other chamberings for the same price: .243 Win, .270 Win, .270 WSM, 7mm-08, .30-06 Spr, .300 Win Mag. Now through the end of September, 2016, Browning is offering substantial cash rebates on rifles, pistols, and shotguns. Save $100.00 on a shotgun, $50.00 on a rifle, or $25.00 with this rebate offer, good on firearms purchases made by September 30th. Browning makes some pretty darn good firearms. This Editor owns a Browning Citori Shotgun and it’s a gem. CLICK HERE for details and Rebate Form. Share the post "Bargain Finder 50: AccurateShooter’s Deals of the Week"